Mangaluru, April 22,2017: The KR, Konkan Railway in coordination with Zonal Railways has announced running of 216 summer special trains to clear the extra rush of passengers during period from April to June as compared to 168 trains in the corresponding period of last year. The move comes in wake of understanding of growing demand and expectation of commuters during summer vacation and has been facilitated on directions by Suresh Prabhu, minister for railways. Konkan Railway believes in providing better services to fulfil expectations of passengers travelling over Konkan region. 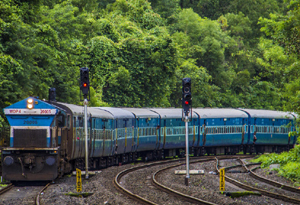 It is engaged in train operations between Roha - Mangaluru for a stretch of 740-kms since 1998. Konkan Railway is playing key role in integrated development of tourist destination on picturesque beaches of Goa. In a region abounding in tourist destination, Konkan Railway acts as catalyst for growth attracting both domestic and foreign tourist.